REW CRM is 2 powerful platforms in one: a content management system for keeping your website content up to date, and a lead management system that helps you stay on top of your relationships. The end result is a responsive CRM designed just for real estate agents, that lets you attract, nurture, and convert online leads into life-long clients. We envisioned a real estate CRM that makes lead management simple and easy, and we made REW CRM out of that vision. The result is a slick, desktop and mobile platform that lets you work through your leads in as few steps as possible; in the office or on the go, REW CRM can be accessed from any device, making it easier than ever to build relationships! Your Agent Dashboard tells you what to do next by prioritizing your most important actions first. Team leaders see newly registered leads and can assign them in 2 quick clicks. Team members’ will then see those newly assigned leads in their dashboards, plus any property inquiries, alongside instant-reply buttons. Once you’ve cleared out your Dashboard actions, it’s time to take full control of your lead management in the CRM. This is where your leads are stored, alongside their contact info, website history, viewed listings, and automated saved searches. The CRM makes it easy for you to keep track of your relationships and build the meaningful connections you need to transform leads into clients. Performance Reports can be auto-generated to review any agent’s performance and follow-up, or to check in on a listing’s lead activity. Our responsive REW CRM has three distinct lead routing options, letting you choose the assignment style that fits your team. This traditional round-robin rotation lets you assign leads evenly among your opted in agents, without doing a thing! Built for teams that value equality and fairness, auto-rotation allows agents to opt in and out, as they have availability within their schedule. A full control option, manual routing is great for leaders who want to carefully monitor workloads and match leads with their best possible agent. Take full control and individually assign every new lead as it comes into the site, divvying up the opportunities as you see fit. Connect instantly to your incoming leads no matter where you are, using the REW Leads iOS and Android app. This companion app works in conjunction with REW CRM, providing you with a suite of features designed for your phone. 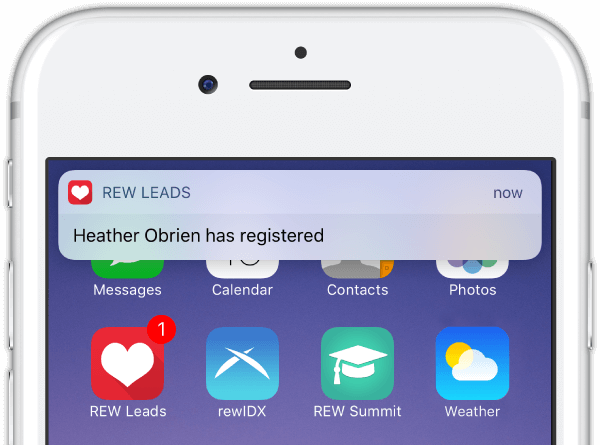 Push notifications, advanced lead routing, and reminders are just a few of the reasons agents already love REW Leads. Learn more here. Having a gorgeous website doesn’t have to be hard! REW CRM was made to build relationships, but it also serves as a one-stop shop for managing and maintaining your REW website. With our real estate CRM, you can update your industry-leading website without advanced technical know-how, on any device. We’ve used our API technology to integrate with some of the real estate industry’s best partners. You can continue to work with the tech tools you love, and adapt our CRM to your unique needs. Following up with your leads is a cinch with REW CRM's integrations! We want you to have the best possible technology, now and in the future. Our real estate CRM is being continually improved with new perks and features, and we’re happy to routinely upgrade your platform for free*. You always have the latest tech with REW CRM. If you’re ready to improve your lead follow up system and create a more profitable team, it’s time to try REW CRM. With 2 powerful platforms in one, REW CRM is the ultimate lead generating system for those willing to harness its potential. Are you ready? *Free upgrades apply to non-customized versions of REW CRM only.